Cypher Space was a collaborative exhibition with fellow artist Leandra Urrutia. Inspired by voter apathy this work culminated in a one night event where people participated in a contrived voting environment. An economy was constructed on a lack of knowledge of encoded consent forms and historical documents. 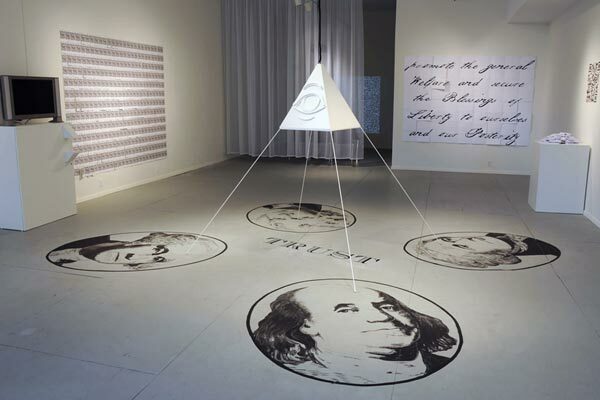 Led and herded by Agents of Providence, viewers were asked for a signature and given false money after walking into the gallery space. Participants were processed through a series of interactive stations. Each station used symbols of freedom to manipulate the shredding of part of the preamble to the Constitution on the far wall. Cycles of interaction were conducted by the use of a bull-horn sounding the close of the stock market. The work explored ideas of social propriety and manipulation as they relate to complacent ideas of freedom.